Woodland Cottage, Cartmel Self-cateringWith beautiful valley views from 300 feet, this cosy cottage is set on its own amongst farmland on a very quiet route in restful countryside. Recently refurbished, very comfortable with open fireplace and large walled garden with mature trees. With beautiful valley views from 300ft, this cosy cottage is set on its own amongst farmland on a very quiet route in restful countryside. Recently refurbished, very comfortable with open fireplace and large walled garden with mature trees. Large walled garden with mature trees and patio, very private, surrounded by farmland. Cartmel with shops, steeplechase course, restaurant and pubs 1 mile. 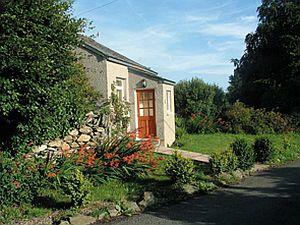 Grange-over-sands with golf course, banks and leisure centre with pool, 2 miles. Steam railway, motor museum, Holker Hall stately home, horse riding, lake Windermere and coast all within 5 miles. M6 junction 15 miles. Children welcome from any age. Woodland Cottage, Cartmel offers weekly bookings starting on Friday and sometimes short breaks. From Cartmel leave on the main road north to Newby Bridge. Leaving the village and in open farmland, take the first left turn. Follow this road past Aynsome Manor Hotel and up the hill at Greenbank. Pass Greenbank Farm on the bend and at the top bear right at the junction. Woodland Cottage is directly after this on the right-hand side.